How have you found a way to turn an everyday item into a place where blades go to retire? The niftier the ideas, the better! I was thinking of using a container with a screw top lid for ease of traveling. I'd like to see some folks ideas here! A small coin bank will do but the vintage ones are priced sky high. A toy from our youth with a slot cut would be cool. A truck from hot wheels or dinky toy would serve well. 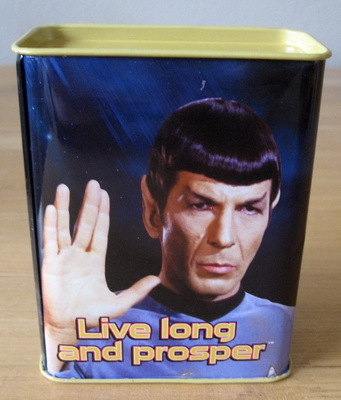 I use a Star Trek coin bank, which I think cost me less than $10. There's a plugged hole in the bottom for emptying it. 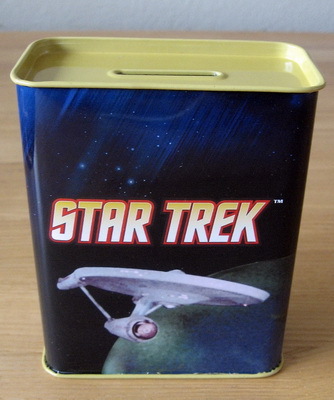 (04-13-2014, 07:25 PM)churchilllafemme Wrote: I use a Star Trek coin bank, which I think cost me less than $10. There's a plugged hole in the bottom for emptying it. (04-13-2014, 06:51 PM)geezer Wrote: I'd like to see some folks ideas here! A small coin bank will do but the vintage ones are priced sky high. A toy from our youth with a slot cut would be cool. A truck from hot wheels or dinky toy would serve well. I use a cigar tin that at one point held three cigars in a triangle style. I glued the top on so that once the blades are in they stay in. I had thought about doing something fancier, but its just going to get tossed when full anyways (only about 25% full after two years of blade sampling so I probably have another five to ten years to fill it). Same here. I use a screw top plastic jar. It just sits underneath the sink so I didn't put a lot of thought into it. A prescripton pill bottle would work; the amber colored ones are translucent enough to see when it's full. Most have a reversible cap to make it childproof.